Pain and itch are unpleasant somatic sensations. Why do we have such sensations? What happens if these sensations are lost? There are patients who cannot perceive pain sensations, referred to as congenital analgesia and congenital pain insensitivity. Even if a part of the body, for example, the back, is burned, a patient with this disorder cannot perceive it. As a result, these patients can have severe burns, and in a worst case scenario, it can result in death. The itch sensation was also shown to be affected (little or not perceived) in most patients with this disorder (Tomioka et al. 2002). The perception of pain and itch sensations are important warning signals to become aware of dangers that occurred in the body in order to avoid further damage of the body. On the other hand, pain and itch are serious problems for patients with chronic pain and itch (pain: including neuropathic pain, cancer pain, hernia, and cingulum; itch: including allergic diseases, liver diseases, and neuropathic itch). The unpleasantness caused by pain and itch evoke negative emotions and stress, which decrease activities in daily life, work, and education and sometimes lead to depression and suicidal thoughts. Moreover, itch evokes not only unpleasantness but also the desire to scratch. Scratching can cause the skin damage, which in turn exacerbates itch in chronic itch patients. This eventually leads to development of the vicious cycle of itch and scratch. Therefore, it is important to control pain and itch as well as scratching. The unpleasantness of pain and itch and the desire to scratch are generated in the brain. How are these mental events generated in the brain? These issues have been the focus of study for researchers. Positron emission tomography (PET), functional magnetic resonance imaging (fMRI), electroencephalography (EEG), and magnetoencephalography (MEG) can noninvasively observe or visualize physiological activity such as neural activity and/or the activity of neurotransmitters in living human brains. Thus, the development of these apparatuses has markedly advanced the understanding of the cerebral mechanisms of itch and pain. The merit of MEG and EEG is higher temporal resolution (unit: ms) than PET and fMRI (unit; min or s). Since neural signals are processed and transmitted in the order of ms, MEG and EEG are strong tools for visualizing information flow in the brain. Pain studies using MEG started in the 1980s (Hari et al. 1983; Huttunen et al. 1986; Kakigi et al. 1995). Since then, many researchers have investigated the cerebral mechanisms of pain sensation. In contrast, itch studies using MEG began in 2009 (Mochizuki et al. 2009). In this chapter, we have introduced what high spatial resolution apparatuses, mainly MEG, have unveiled regarding the cerebral mechanisms of pain and itch. The pain sensation is mediated by Aδ- and C-fibers. The activation of Aδ-fibers evokes a sharp pain sensation while that of C-fibers evokes a burning sensation. The ideal pain stimulation for MEG is pain-specific, controllable, safe, and repeatable. Laser beam stimulation such as CO2 and Tm: YAG to the skin and electrical stimulation satisfy all of the above. Thus, they have frequently been used in pain studies using MEG. Figure 1 shows the typical magnetic responses while the dorsum of the left hand was stimulated by laser. The source location of the magnetic responses observed in the central area (Fig. 1a) was estimated to be the primary somatosensory cortex (SI). Since laser stimuli were applied to the left hand, the contralateral SI (i.e., the right SI) was activated. 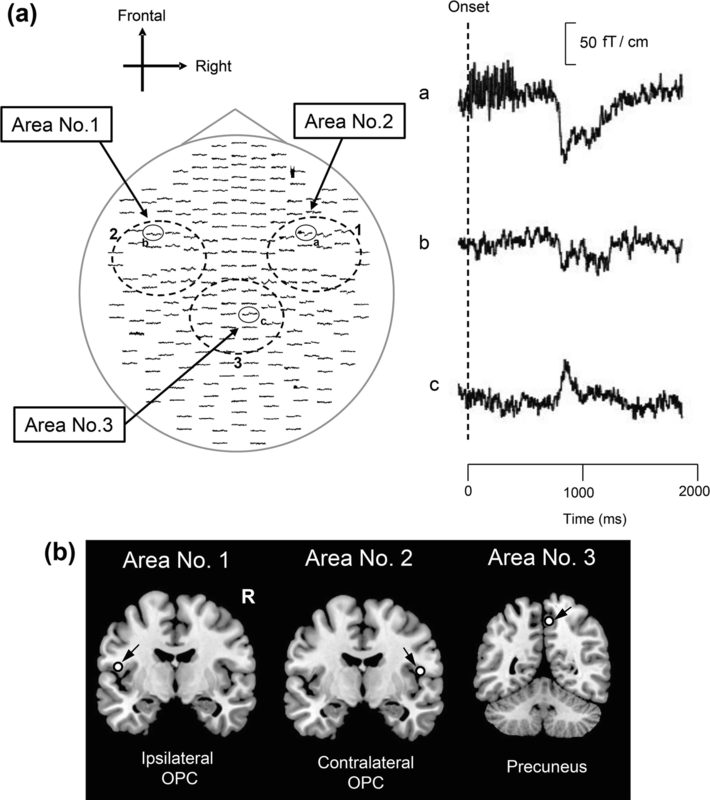 The source location of the magnetic responses observed in the bilateral frontotemporal areas (Fig. 1b, c) was estimated to be the secondary somatosensory cortex (SII). Kakigi et al. (1995) reported that dipoles for stimulating the arm and those for the leg were located in the Sylvian fissure including SII and insula (IC), although there was no consistency in somatotopical organization for the arm and leg among subjects in the Sylvian fissure, their locations differed by less than 2 cm, which suggested the existence of somatotopy in the Sylvian fissure for noxious processing. A precise investigation was performed by Baumgärtner et al. (2010) using high spatial resolution fMRI. They found hand-foot somatotopy in the contralateral anterior and posterior IC and in the contralateral parietal operculum for heat stimuli. SI consists of three cytoarchitectural subdivisions, areas 3, 2, and 1. Anatomical studies have demonstrated that information from the deep body tissues such as muscles and joints reach areas 3a and 2, while areas 3b and 1 receive information from the skin (Hyvärinen and Poranen 1978; Iwamura et al. 1993; Powell and Mountcastle 1959; Kandel 2000). Consistent with these anatomical studies, MEG studies showed that source localizations in SI for tactile stimuli were estimated to be area 3b and 1 (Ploner et al. 2000; Kakigi et al. 2000; Kida et al. 2007). 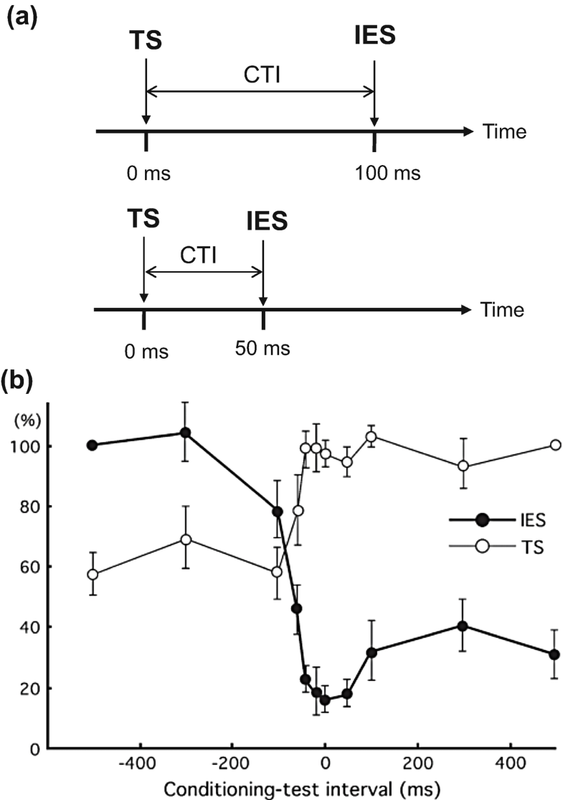 Area 3b responded to innocuous somatosensory stimuli 20–30 ms after the stimulus onset (Wood et al. 1985; Allison et al. 1989a, b; McCarthy et al. 1991) and area 1 responded later than area 3b (Ploner et al. 2000; Inui et al. 2003). In contrast, pain studies using MEG reported that only area 1 responded to noxious stimuli (Ploner et al. 1999; Kanda et al. 2000; Inui et al. 2003). However, single unit recordings in monkeys showed nociceptive SI neurons in areas 3b and 1 (Kenshalo and Isensee 1983). One possibility to explain why the magnetic response in area 3b was not observed in previous MEG studies may be due to the lower number of neurons in area 3b than in area 1 (Chudler et al. 1990). In previous MEG studies that observed area 3b response to tactile stimuli, median nerve stimulation was used as the tactile stimuli. On the other hand, pain studies using MEG used laser stimuli. The area to be stimulated was a tiny spot for laser stimuli, while a much larger skin area was stimulated for the median nerve stimulation. Thus, the total number of neurons in area 3b that responded to the nerve stimulation may have been much higher than that responding to the laser stimuli. This may be another reason for the lack of a clear response in area 3b to noxious stimuli. Unfortunately, there is currently no clear evidence to explain the discrepancy between single unit recordings and pain studies using MEG. 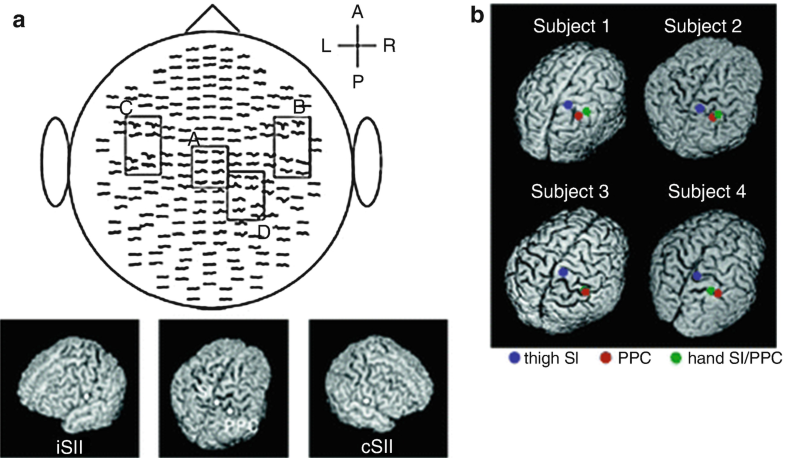 The peak latency of painful stimuli-evoked magnetic responses in the contralateral SI, contralateral SII, and ipsilateral SII reported in previous MEG studies were 164–217, 160–212, and 169–213 ms, respectively (Ploner et al. 1999, 2000, 2002; Kanda et al. 2000; Nakata et al. 2004). A human microneurography study demonstrated that the conduction velocity (CV) of Aδ-fibers was about 19 ms (Adriaensen et al. 1983). In a monkey study, the CV of the spinothalamic tract (STT) was found to be 8.0 ms by determining STT neurons with antidromic activation in the contralateral posterior part of the ventral medial nucleus in the thalamus (Dostrovsky and Craig 1996). Similar CVs were reported in a human study in which the CV of the STT using laser-evoked potentials was estimated to be approximately 8–10 ms (Kakigi and Shibasaki 1991). In addition, the CV of thalamocortical fibers was estimated to be 33 ms based on the somatosensory evoked potentials of electric stimulation (Desmedt and Cheron 1980). Based on CVs, it takes over 110 ms for the signals evoked by laser to be transmitted from the hand to the cerebral cortex. On the other hand, the CV of C-fibers and STT associated with C-fibers are 1.2–2.4 m/s (Towell et al. 1996; Magerl et al. 1999; Tran et al. 2001) and 2.9 m/s (Tran et al. 2002), respectively, based on laser-evoked potential studies. Thus, it takes over 500 ms for signals to be transmitted from the hand to the cerebral cortex. The peak latency of the magnetic responses observed in the previous MEG studies was about 200 ms. Thus, magnetic responses are suggested to be derived from the excitation of Aδ-fibers. Kakigi et al. (1995) compared the peak latency and source location (i.e., dipole) of painful stimuli-evoked magnetic responses when a CO2 laser was applied to the arm compared to when it was applied to the leg. They observed that the peak latency for the stimulation of the leg was 50 ms longer than that of the arm. This difference was attributed to the distance between the leg and brain being longer than that between the arm and brain. In all previous pain studies using MEG, peak latency was shorter for the contralateral SII than for the ipsilateral SII (e.g., Yamasaki et al. 1999; Ploner et al. 2000, 2002; Kanda et al. 2000; Nakata et al. 2004, 2008, 2009). The difference in latency between contralateral and ipsilateral SII was 1–25 ms (mean: 13.8 ms) in these studies. Ploner et al. 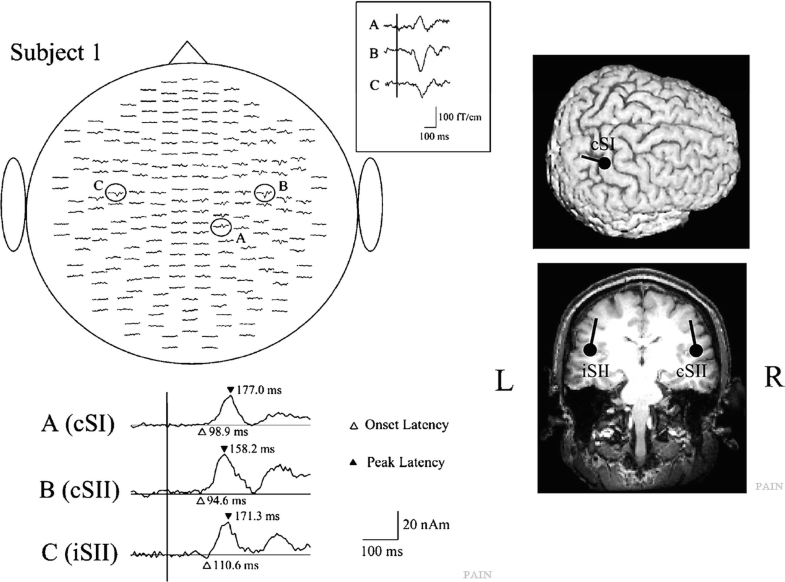 (2000) reported that differences in peak latency between the contralateral and ipsilateral SII for tactile and laser stimuli were 11 and 15 ms, respectively. Similar values were also observed in other MEG studies (e.g., Mauguière et al. 1997). The difference in peak latency has been interpreted to reflect the time to transmit a neural signal from the contralateral SII to the ipsilateral side. Pain is a complex sensation composed of sensory-discriminative and motivational-affective components. SI and SII are considered to be the main regions for the sensory-discriminative component. Animal studies have demonstrated that there are neurons responsive to nociceptive stimuli in SI and most of the neurons encode the stimulus intensity of noxious stimuli (Chudler et al. 1990; Kenshalo and Isensee 1983; Kenshalo et al. 1988). Unit recoding studies in monkeys have demonstrated that the intensity coding of neurons responsive to noxious stimuli in SII appeared to be poorer than that in SI (Dong et al. 1989, 1994). Analogous to these animal studies, a MEG study observed that the relationship between SI activity and stimulus intensity closely matched the subjects’ pain ratings, while SII activity exhibited an S-shaped function with a sharp increase in amplitude only at stimulus intensity well above the pain threshold (Timmermann et al. 2001). Similar results were also reported in human fMRI and intracranial recoding studies (Bornhövd et al. 2002; Frot et al. 2007). Thus, it has been considered that SI plays more important role in the intensity coding of pain than SII. However, a recent study using noninvasive brain stimulation such as Transcranial Magnetic Stimulation (TMS) reported that when TMS pulses were delivered over S2, participants’ ability to judge pain intensity was disrupted, as compared to S1 and vertex (control) stimulation (Lockwood et al. 2013). Based on this finding, the authors of this study have suggested that early-evoked activity in human SII makes a necessary causal contribution to encoding the intensity of noxious stimuli. 2.4 Parallel or Serial Processing? Noxious stimuli, as well as innocuous tactile stimuli, activate SI and SII. However, the temporal profiles of SI and SII activations for noxious stimulation clearly differ from those for tactile stimulation. Intracranial and MEG recordings have demonstrated that the activation of SI precedes the activation of SII in innocuous tactile processing (Allison et al. 1989a, b; Hari et al. 1993; Mima et al. 1998; Schnitzler et al. 1999). These temporal patterns of SI and SII activations for tactile stimulation are not inconsistent with anatomical projections from SI to SII (Gardner and Kandel 2000). Thus, SI and SII have been suggested to have serial processing for innocuous tactile stimuli. In pain studies using MEG, the activation of SI was almost the same as that of SII (e.g., Ploner et al. 1999; Kanda et al. 2000; Nakata et al. 2004, 2009). Thus, serial processing cannot explain the activations of SI and SII for noxious stimuli. Ploner et al. (1999) described that the simultaneous activation of SI and SII for noxious stimuli contributed to independent anatomical and functional pathways from the thalamus to SI and SII, such as the pathways from the ventroposterior lateral thalamic nucleus (VPL) to SI and from the ventroposterior inferior thalamic nucleus (VPI) to SII (Gingold et al. 1991; Friedman and Murray 1986; Stevens et al. 1993; Apkarian and Hodge 1989; Apkarian and Shi 1994; Dong et al. 1989; Kenshalo and Willis 1991). Thus, some researchers have proposed that SI and SII have parallel processing for noxious stimuli. However, Inui et al. (2003) reported that the activation of SI for noxious stimuli occurred earlier than that of SII. The peak latency of SI in previous MEG studies reported the simultaneous activations of SI and SII for noxious stimuli were later than 160 ms (Ploner et al. 1999, 2000, 2002; Kanda et al. 2000; Nakata et al. 2004). Inui et al. (2003) observed magnetic responses for noxious stimuli in SI at not only around 160 ms but also 88–100 ms after the stimulus onset. Source localizations for the earlier (i.e., 88–100 ms) and later (i.e., around 160 ms) responses were estimated to be area 1. In other words, the responses originated from the same area. Interestingly, the peak latency of the first response in SI was earlier than that of the response in the contralateral SII, indicating that serial processing cannot simply be ruled out. 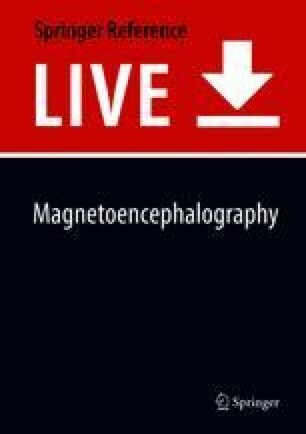 Another MEG study suggested that the magnetic response in SI reported in previous pain studies using MEG may be the response in the posterior parietal cortex (PPC) (Nakata et al. 2008). In most previous MEG studies, noxious stimuli were applied to the hand. One of the magnetic responses to noxious stimuli is commonly observed from MEG sensors around the top of the head (Fig. 1). Previous MEG studies estimated the source location of the response to be SI. Anatomically, SI and PPC are located adjacent to each other. Therefore, it is not easy to distinguish the magnetic response in SI from that in PPC. In a MEG study conducted by Nakata et al. (2008), noxious stimuli were applied to the thigh, which is easier to distinguish anatomically from PPC. The distribution of the magnetic responses in the central areas when noxious stimuli were applied to the hand (Fig. 1) was clearly different from when noxious stimuli were applied to the thigh (Fig. 2a). As shown in Fig. 2b, two dipoles were observed in the post central gyrus when the thigh was stimulated. On the other hand, only one dipole was observed when the hand was stimulated. These results indicate that the activation of SI and PPC cannot be distinguished when the hand is stimulated. Interestingly, in the thigh stimulation condition, the peak latency of the magnetic response in SI was 151 ms and significantly shorter than that in SII, while that in PPC was 183 ms, which was almost the same latency as that in SII. Based on this finding, they suggested that there may be serial processing for noxious stimuli and the findings of previous MEG studies may not be SI, but PPC. It has not yet been clarified whether noxious processing is parallel or serial. The pain sensation induced by the excitations of C-fibers evokes aching, burning, throbbing, and dull sensations. They are clearly different perceptions from the pain induced by the excitation of Aδ-fibers, which evokes sharp and pricking sensations. Noxious stimuli using laser stimuli and electrical stimuli activate both Aδ- and C-fibers or selectively activate Aδ-fibers. However, the cerebral responses to noxious stimuli that can be measured are commonly associated with Aδ-fibers. Thus, findings observed in the pain studies discussed in the previous sections were all associated with the pain sensation mediated by Aδ-fibers. It is difficult to measure cerebral responses to noxious stimuli associated with C-fibers by just applying laser and electrical stimuli to the skin because of the suppression of cortical responses associated with C-fibers by those associated with Aδ-fibers. One of the methods used to investigate the cerebral processing of C-fiber pain has been a physical block of the conduction of A-fibers by the compression of nerve fibers. Ploner et al. (2002) used this method and observed the activations associated with C-fiber pain in bilateral SII and ACC. Meanwhile, a novel method using CO2 and YAG lasers to selectively stimulate C-fibers was developed (Tran et al. 2001, 2002; Qiu et al. 2003, 2006). This method involves placing an aluminum plate with many tiny holes on the skin where laser stimuli are applied (Fig. 3). The peak latencies of the magnetic responses in SI and SII were longer than 700 ms when the stimuli were applied to the hand (Kakigi et al. 2003), which was clearly a different latency from noxious stimuli associated with Aδ-fibers. A microneurographic study confirmed that the novel method selectively excited C-fibers (Qiu et al. 2003). Forss et al. (2005) compared cortical processing between Aδ-fiber- and C-fiber-related pain. They reported that the peak latencies of the magnetic response to laser stimuli were much shorter for Aδ-fiber pain than for C-fiber pain, while the source localizations were not significantly different. Thus, they suggested that nociceptive inputs mediated by Aδ- and C-fibers are processed in a common cortical network in different time windows. A pain study using fMRI reported significant differences in the activities in the anterior cingulate cortex (ACC) and IC between Aδ- and C-fibers (Qiu et al. 2006). These different perceptions between Aδ- and C-fibers may contribute to motivational-affective components such as ACC and IC rather than sensory-discriminative components such as SI and SII. The pain sensation can be modulated by psychological factors such as the manipulation of attention to pain, relaxation, and mental stress or physiological factors such as the interference of pain perception by applying noxious and innocuous somatosensory stimuli or movements. Qiu et al. (2004) investigated the underlying mechanism of pain inhibition by distracting attention from pain using MEG and EEG. To distract attention from pain, subjects were asked to perform a mental arithmetic task while noxious laser stimuli were applied to the dorsum of their hands. All subjects reported that the subjective pain sensation decreased during the distraction task. They observed that noxious stimuli-related responses in the contralateral SI, bilateral SII, cingulate cortex, and medial temporal areas were markedly diminished while subjects performed the distraction task. Similar results were also reported in other studies (Yamasaki et al. 1999; Schlereth et al. 2003). It has been demonstrated that attention, such as shifting attention between stimuli and sustaining attention to or distracting attention from stimuli, is controlled by several brain regions, such as the prefrontal, cingulate, and parietal cortices, thalamus, and reticular formation (the attention control system) (Coull 1998; Raz 2004). Thus, these regions are considered to play important roles in attention-related neural activity changes in the brain regions associated with pain (Peyron et al. 2000; Lenz and Treede 2002; Villemure and Bushnell 2002). Some researchers reported that the analgesic effect by distraction was associated with the activation of descending inhibitory control (Tracey et al. 2002; Valet et al. 2004). Simply said, descending inhibitory control is accomplished by inhibiting the pain-related ascending neural signal at the spinal level by descending neural signals from the periaqueductal grey and rostral medulla (Millan 2002). However, since the task to distract attention from pain modulates not only attention but also stress and mood levels, it is still controversial whether high cognitive demanding tasks are an appropriate method to investigate the neural mechanism of pain modulation by attention (e.g., Villemure and Bushnell 2002). Another well-known pain modulation system is the gate control theory, in which excitation of the thick fibers conducting the tactile sensation (e.g., Aβ-fibers) inhibits nociceptive ascending signals conducted by thin fibers (e.g., Aδ- and C-fibers) in the spinal cord through the interneurons of substantia gelatinosa. Following this model, pain sensation is not inhibited if noxious ascending signals pass through the spinal dorsal horn before ascending signals mediating the tactile sensation reach there or noxious stimuli are applied after ascending signals mediating tactile sensation reach the brain. Inui et al. (2006) investigated the issue using MEG. They attached electrodes for noxious electrical stimuli and tactile stimuli to the right side of the back 4 cm lateral to the ninth thoracic vertebral spinous process. The electrical noxious stimulus (i.e., intra-epidermal electrical stimulation (IES)) was current constant double pulses at 100 Hz with a 0.5 ms duration (Inui et al. 2002). The tactile stimulus (TS) was double pulses at 100 Hz with 0.5 ms duration. They randomly changed the timing to apply the conditioning stimulus (i.e., the tactile stimulus) relative to the test stimulus (i.e., IES). The conditioning-test intervals (CTIs) were −500, −300, −100, −60, −40, −20, 0, 50, 100, 300, and 500 ms (see also Fig. 4a). Interestingly, the pain sensation was reduced when TS was applied 20–60 ms earlier than IES and even when IES was applied much later (e.g., 500 ms) than TS. The magnetic response supported the behavioral results. As shown in Fig. 4b, the magnetic response associated with IES was reduced to less than 60% of the control (IES 500 s before TS). They suggested that cortical responses to noxious stimuli can also be inhibited by innocuous tactile stimuli at the cortical level. These findings strongly demonstrate that the underlying mechanism of pain inhibition by tactile stimuli is not only the gate control theory. It has recently been demonstrated that time frequency information (i.e., oscillatory activity) encodes or reflects several mental states such as cognition, emotion, perception, and thought. For example, several researchers reported an association between alpha oscillation (around 10 Hz) and pain perception. Kakigi et al. (2005a, b) reported that the power of the alpha band increased while a Yoga master in meditation did not feel the pain sensation. Nir et al. (2010) reported that subjects with higher frequency, which was maximum in power within the alpha range (i.e., 8–12 Hz) during the resting state, perceived noxious stimuli as being more intense. Other studies demonstrated that the gamma frequency range (40–100 Hz) reflected pain perception. Gross et al. (2007) showed that gamma power at a frequency between 60 and 95 Hz in the contralateral SI (i.e., SI in the left hemisphere) increased when laser stimuli were applied to the right hand. Pain-induced gamma oscillations were observed around 100–300 ms after the stimulus onset, indicating the excitation of Aδ-fibers. The power of gamma oscillations increased with increments in stimulus intensity and subjective pain sensation. Interestingly, they reported that laser-evoked magnetic responses in SI were observed regardless of whether subjects perceived stimuli as painful or not, whereas the power of gamma oscillations in the region was observed only when stimuli were painful for subjects. It was reported that the power of gamma oscillations was modulated by the manipulation of subjects’ attention to pain (Hauck et al. 2007). Alpha and gamma oscillations are not specific to pain. These oscillations are also observed in other modalities. However, at least, these oscillations may be useful for the evaluation of subjective pain sensation and assessment of chronic pain. Itch is an unpleasant sensation with the desire to scratch. It has been hypothesized for a long time that itch is induced by the low-frequency excitation of nociceptors also mediating the pain sensation. However, observations contradicting this hypothesis have also been reported such as morphine used for pain relief evoking itch sensation. Several researchers recently reported direct evidence that itch is not just a weak pain. For example, Schmelz et al. (1997, 2003) found C-fibers selective for histamine, a representative substrate to evoke itch. Andrew and Craig (2001) reported that some STT neurons responded to the application of histamine but not to mustard oil which evokes the pain sensation. More recently, it was found that STT neurons expressing gastrin-releasing peptide receptor transfer neural signals associated with itch to the brain (Sun et al. 2009). Thus, it is generally accepted in the itch and pain research fields that itch is a sensation independent of pain and has a different mechanism from pain. In fact, one can distinguish them as different sensations such as “itch” and “pain.” Several researchers have attempted to identify how the brain distinguishes these sensations. To the best our knowledge, the first study to investigate the brain mechanism of itch perception was reported by Hsieh et al. in 1994. It was a PET study. Since then, several researchers have conducted PET and fMRI studies and reported that histamine- or cowhage-induced itch activates several brain regions including the prefrontal cortex, primary motor cortex, supplementary motor area, premotor cortex, parietal cortex, SI and SII, cingulate cortex, IC, basal ganglia, and cerebellum (Darsow et al. 2000; Drzezga et al. 2001; Leknes et al. 2007; Mochizuki et al. 2007; Herde et al. 2007; Papoiu et al. 2012). However, it was still unclear how these regions interact with each other. To visualize itch-related information flow in the brain, it was necessary to measure neural activity in the brain in the order of ms, since neural signals are transmitted in that order. However, it was necessary to develop an itch stimulus which could repeatedly evoke short duration-itch sensations (i.e., ∼a few s) to measure itch-related brain activity using EEG and MEG. Histamine or cowhage do not satisfy these conditions. The application of electrical stimulus to the skin can evoke the itch sensation (Edwards et al. 1976; Shelley and Arthur 1957; Tuckett 1982). Ikoma et al. (2005) then established a stimulus condition to evoke the itch sensation with an electrical current. The stimulus can easily control the duration of the itch sensation and repeatedly apply itch stimuli. Thus, Mochizuki et al. (2008) developed electrodes for the electrical itch stimulus and confirmed that the itch sensation evoked by electrical itch stimuli is associated with C-fibers and the cerebral responses to the electrical itch stimuli can be measured using EEG. Using the stimulus and MEG, Mochizuki et al. (2009) first visualized cerebral responses to the itch stimuli in the order of ms. They reported that magnetic responses to the itch stimuli were mainly observed in the bilateral fronto-temporal areas and centroparietal area (Fig. 5a). The mean source localizations of the magnetic responses obtained from subjects were the bilateral opercular cortex (OPC) and precuneus (Fig. 5b). The peak latency of the magnetic responses in the contralateral OPC was significantly shorter than that in the ipsilateral OPC (contralateral side: 740 ± 76 ms, ipsilateral side: 785 ± 76 ms). This difference in latency would reflect the transmission of neural signals from the contralateral to ipsilateral OPC. The peak latency of the magnetic response in the precuneus was between the contralateral and ipsilateral OPC. Interestingly, no previous pain or tactile studies using MEG and EEG reported dipoles in the precuneus (e.g., Forss et al. 2005; Inui et al. 2003; Kakigi et al. 2005a, b; Kanda et al. 2000; Nakata et al. 2008; Opsommer et al. 2001; Ploner et al. 1999, 2000), which implied that some differences exist in parietal processing between itch and pain. However, some pain and tactile studies using PET and fMRI also observed activation of the precuneus (de Leeuw et al. 2006; Iadarola et al. 1998; Kitada et al. 2005; Niddam et al. 2008). Thus, activation of the precuneus may be not specific to itch in somatosensory processing. Unfortunately, the precise role of the precuneus in somatosenory processing is not fully understood. Some neuroimaging studies concerning pain reported that the precuneus was associated with empathy for pain, pain hallucination, and the modulation of pain by hypnosis (Bär et al. 2002; Faymonville et al. 2006; Jackson et al. 2006; Ochsner et al. 2008; Schulz-Stübner et al. 2004). A recent study using voxel-based morphometry (VBM) technique reported that subjective pain sensation provoked by experimentally induced heat pain is greater in subjects with lower grey matter in the precuneus and posterior cingulate cortex (PCC) (Emerson et al. 2014). A study using EEG reported that pain sensitivity correlated negatively with activity in the left precuneus, such that large pain-related increases in precuneus activity were associated with small increments in the sural nerve stimulation strength necessary to progress from a non-painful to a painful state (Goffaux et al. 2014). These findings suggest that the precuneus may be associated with pain and itch perceptions. MEG is a strong tool to investigate information flow in the brain with high temporal resolution. Several aspects of the cerebral processing of pain have been unveiled. For example, SI and SII respond to noxious stimuli mediated by Aδ-fibers about 100–200 ms after the stimulus onset, while those mediated by C-fibers respond much later. Pain inhibition by tactile stimuli occurs not only in the spinal cord (i.e., the gate control theory) but also in the brain. The intensities of the responses of SI and SII to noxious stimuli are closely related to the stimulus intensity and subjective pain rating, which supported these regions being associated with the sensory-discriminative component of pain. Oscillation studies have reported that oscillation activity is a good indicator to evaluate subjective pain sensation. At the same time, new questions have also been raised. For example, it is still unclear whether SI and SII have a serial or parallel pathway, what mechanism underlies pain inhibition by tactile stimuli, and why is subjective pain sensation reflected by oscillation activity? Studies investigating the itch sensation using MEG have been too few to discuss the cerebral processing of itch. There are still many questions that remain to be answered in the pain and itch research fields.